Habit: Annual, perennial herb [shrub]. Stem: prostrate to erect. Leaf: simple or pinnate, generally opposite, sessile or petioled. Inflorescence: heads radiate or discoid, occasionally disciform, generally few in California; involucre cylindric to bell-shaped; phyllaries in 2 dissimilar series, outer generally +- leaf-like in texture, inner thinner, with transparent or scarious margins; receptacle paleate; paleae narrow, flat. Ray Flower: 0 or few; ray yellow or white. Disk Flower: generally many; corolla yellow, radial (or outermost white, bilateral). Fruit: narrowly club-shaped, thick or compressed front-to-back; pappus 0 or awns 1--several, generally barbed. Habit: Annual, +- glabrous. Stem: 5--12 dm, square. Leaf: pinnate, petioled; leaflets 2--8 cm, lanceolate, generally acuminate, serrate. Inflorescence: heads radiate or discoid, erect; peduncle 2--10 cm; involucre +- 1 cm diam, hemispheric; outer phyllaries 5--8, 1--5 cm, +- linear, ciliate; inner phyllaries 5--7 mm, ovate; paleae 5--7 mm, +- brown. Ray Flower: 0--few; corolla 2--3.5 mm, yellow. Disk Flower: corolla +- 2 mm, orange. Fruit: 6--10 mm, +- black, narrowly wedge-shaped, compressed front-to-back, +- glabrous to stiffly hairy; pappus awns generally 2, 3--4.5 mm. Chromosomes: 2n=24,48,72. 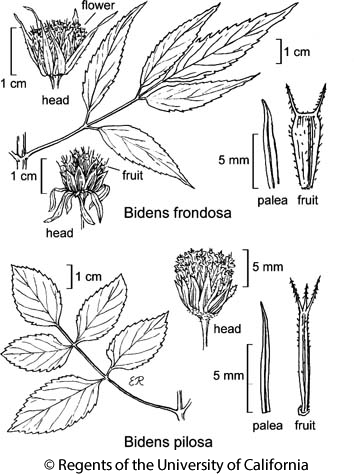 Citation for this treatment: David J. Keil 2012, Bidens frondosa, in Jepson Flora Project (eds.) Jepson eFlora, http://ucjeps.berkeley.edu/eflora/eflora_display.php?tid=1702, accessed on April 23, 2019. NW, CaR, SN, GV, n CCo, SW, GB, DMoj (Mojave River); Markers link to CCH specimen records. Yellow markers indicate records that may provide evidence for eFlora range revision or may have georeferencing or identification issues. Purple markers indicate specimens collected from a garden, greenhouse, or other non-wild location.